Do we need books in technology enhanced learning (TEL)? 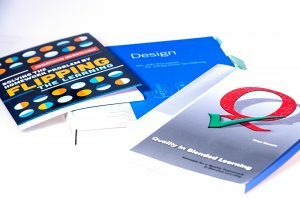 In the last three years I met many people mentioning that they use eLearning in their teaching and books are outdated. But – is this true? First of all, it would be necessary to clear the term “eLearning”. This term says nothing and expresses everything – from an objective point of view it is more or less meaningless. E-learning is networked making it capable of updating, storage and retrieval, distribution and sharing of instruction or information. It is delivered to the end-user via a computer using standard internet technology. eLearning is more than eTraining. A modern description is done by the North Carolina Education Cabinet (as one example taken from the USA) and defines “eLearning is learning utilizing electronic technologies to access educational curriculum outside of a traditional classroom”. Rosenberg’s descriptions are approx. 20 years old. The modern version also does not match with the reality. The term eLearning must be replaced by the new expression technology enhanced learning (TEL). Technology enhanced learning is used to refer to technology enhanced classrooms and learning with technology (and not through technology), which means a learner centered approach using the technology for the learning. Where is the place for “traditional” books? Books are still available – Amazon started the business success by selling books (and still sells them), libraries are still used intensively by people borrowing books there. Masses of books – in small quantities – are published and printed as “book on demand”. Books are transferred to the digital age as eBooks. The reader used an eBook reader (like Kindle, Kobo, or Tolino) or read the book by a viewer on their digital device (laptop, tablet). Printed books provide all the advantages of technology enhanced learning: you can read them at any time, everywhere, and in your own pace. An advantage is the use of books without energy (you must not recharge your book). Another big advantage is that you can share the book easily (this is more or less impossible with eBook readers) and that books have page numbers. Did you ever try to cite a text correctly from a eBook without any page information (pure PDF documents often have page numbers but do not supply the advantages of eBook readers like enlarging the fonts). Rosenberg, Marc Jeffrey (2001): E-learning. Strategies for delivering knowledge in the digital age. New York, NY: McGraw-Hill.